Two security workers collecting boxes of cash from a Sussex bank locked themselves inside the building following an attempt to rob the pair, police have said. 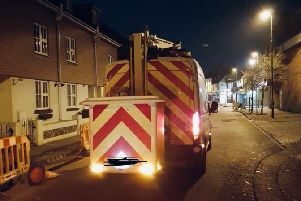 Police said the two-person crew from a G4S security van were collecting the money from the Santander Bank in Queens Road, Hastings, at about 9pm on Friday (September 30). Two men on a moped pulled up at the junction with Castle Hill Passage moments later. Officers said they approached the security crew who locked themselves in the bank. The men have been described as wearing dark clothing and white helmets. Alternatively, you can call independent charity Crimestoppers anonymously on 0800 555 111 (www.crimestoppers-uk.org).